Antifungal, antiseptic and clearing. This organic Eucalyptus Essential Oil has a full-bodied, herbaceous and fresh aroma with vibrant therapeutic properties. Grown in Spain and certified organic by ECOCERT, eucalyptus oil has been traditionally inhaled for relief during a chill or the cold season. Organic Eucalyptus Essential Oil is an excellent respiratory oil for clearing blocked sinuses when vaporised from a tissue or burner. Due to the oils stimulating and warming action, it is highly effective at easing overworked muscles and every-day aches and pains when used in the bath or massage blends. It also makes an extremely effective insect repellent. 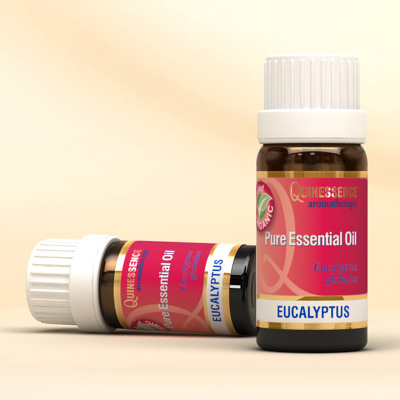 This particular species of Eucalyptus is generally considered to be non-irritant and non-sensitising, however do not use Organic Eucalyptus Globulus Essential Oil on children under the age of 2 years. If a baby inhales the vapour of the undiluted oil it may cause spasm of the epiglottis as a reaction to the sudden cooling effect on the respiratory system. Eucalyptus Radiata Essential Oil is considered a more suitable eucalyptus oil for use with young children over 2 years old. Eucalyptus Globulus Essential Oil is indispensable for all types of infection control such as preventing coughs and colds spreading, and in research, a concentration of only 2% dispersed in a vaporizer was shown to destroy 70% of the Staphylococcus bacteria in the affected room.